Anker’s popular battery packs and charging gear, two affordable robotic vacuums, Amazon’s Fire HD tablets, and more start off this week’s deals. With a 12 hour battery, expandable storage, and hands-free Alexa support, Amazon’s Fire HD 8 is already one of the best deals in the tablet market for its usual $80. Today though, you can pick one up for an impulse-friendly $40, as long as you don’t mind buying a refurb. That’s the same price as a refurbished Fire 7 tablet, which is worse in pretty much every way. Just note that this deal is only available for Prime members. Need more storage space for your action cam, dash cam, tablet, or Nintendo Switch? This 128GB card from SanDisk is down to its best price of the year right now. If you ever have to deal with power shortages and brief outages, Amazon’s offering the best price ever on a great UPS battery backup, today only for Prime members. If you use a desktop computer, this will of course keep your machine running without any interruption in the event of a power outage, which means you won’t lose any unsaved work. But even if you only use laptops and mobile devices at home, it could still run lamps, your router and modem, or even a TV until the power comes back on. $125 is about $40-$60 less than usual, and the best price ever by $15, but it’s only available for Prime members. The Kindle Paperwhite is the best e-reader for almost everyone, and at $70 for a refurb, it’s never been cheaper than it is today. And don’t worry, you’ll still get the same 1-year warranty you’d get if you bought it new. Polk Audio’s PSW10 has long been a go-to value pick for anyone building a home theater audio system, and you can pick one up for $80 on Amazon today, the best price we’ve seen all year. After much research, I bought this exact model several years ago, and absolutely loved it up until the day I replaced it with one of VIZIO’s surround sound bar systems. It’s not the best subwoofer out there by any means, but it’s eminently affordable, and should be more than adequate anyone who’s not an audiophile. Even at its usual $69, Google’s Chromecast Ultra is the cheapest 4K and HDR-compatble streaming dongle on the market, and today, you can save an extra $20 by buying it from Walmart today, the best price we’ve ever seen. If you don’t see the use for 4K and HDR, the standard Chromecast is also $10 off, as is the stereo-focused Chromecast Audio. Even if you already have one at home, these are great for keeping in your luggage for use in hotel rooms. Amazon’s kicking off more Prime Day lead-up deals today, and the highlight is a collection of popular Anker gear, marked down to some of the best prices we’ve seen. The highlight for me is this 5-port USB charging hub with USB-C Power Delivery for $25, easily an all-time low. In addition to charging your phones and tablets, its USB-C port is powerful enough to charge a MacBook or Nintendo Switch in portable mode. On the USB-C front, you can also get Anker’s Power Delivery battery pack for $90, which unlike almost every competitor, includes a USB-C wall charger in the box that can recharge the battery quickly, or be used as a charger for other gadgets. Don’t need USB-C in your battery? A couple of the company’s standard PowerCores are also included in the sale, one pocket sized, and one that’s much larger (though we’ve seen that one a few bucks cheaper in the past). For the rest of the deals, including a smart car charger, PowerLine charging cables, and a Qi pad, be sure to head over to Amazon, and remember that these prices are only available today, and only for Prime members. Update: Today’s the last day! Samsung’s quantum dot-powered Q8 TV isn’t exactly easy on the bank account, but it would be a stunning upgrade to your home theater, and you can save $400 on the 55" model today, $800 on the 65", or a whopping $1000 on the 75"
Okay, so with that background out of the way, Samsung’s 2018 Q-series TVs utilize quantum dots to great effect. That Gizmodo review is about the 2017 model, but most of it will still apply to this set. Just note that to get the larger sizes, you’ll need to add the 55" to your cart, and select your size there. USB-C Power Delivery is the future, and you can add it to your car with this $22 charger (with promo code POWERDRC). In addition to a regular USB port, you get a 30W USB-C port that can charge a MacBook or Nintendo Switch at full speed. If your laptops run off of USB-C anyway, this is a much sleeker solution than an AC inverter. If you got yourself a nice new TV, you can mount it to your wall for just $12 today, complete with a bonus HDMI cable. Just use promo code PBL473S4 at checkout to save. Amazon’s Echo Dot is a great voice assistant, and a truly terrible speaker. But for just $24 (with promo code CV8P5PWD), you can drop it into this speaker base, which replaces its puny 3W driver with a stereo pair of booming 10W drivers. Plus, the built-in 5,000mAh battery pack lets you move it all around your house, and even doubles as a smartphone charger. Note, the black one doesn’t have any Amazon reviews, but you can read some impressions on the white model’s product page. With 126 local dimming zones, Dolby Vision HDR support (that’s the good one), and built-in Chromecast, Vizio’s 2017 P-Series XLED TVs are stunners, and you can grab the 55" version from Walmart for $700 right now, which is at least $100 less than elsewhere on the web. This tiny, $6 USB charger isn’t much bigger than the one that ships with every iPhone, except it has two ports, folding prongs, and 2.4A of total power, compared to the 1A Apple gives you. No surprise, it’s one of our top sellers of all time. Just use promo code OXLNLY6V to get the deal. Ecovacs makes some of the most popular budget-friendly robotic vacuums out there, and two of their best models are cheaper than ever today, for Prime members only. Update: After we published this post, Amazon added the Wi-Fi equipped ECOVACS DEEBOT N79s to the sale for $170, again, for Prime members only. The OZMO 601 includes Wi-Fi and app support, as well as the ability to use it as a mop, in addition to vacuuming. $260 is a whopping $120 less than usual. The DEEBOT 900, on the other hand, can’t be used as a mop, but it does have higher suction power, and sensors that can actually map out your home for better navigation, rather than ping ponging around randomly like most vacuums in this price range. $280 is $120 less than usual, and an all-time low. Spain: Better at tourism than penalty kicks. Trust me on this one. Prices vary by date and departure airport, so play around with your options to find the best deal. In preparation for Prime Day, Amazon’s taking $120 off the Echo Show today for Prime members, if you don’t mind buying a refurb. You can read Gizmodo’s review if you want to learn more, but it turns out Alexa would have benefitted from a visual component all along. Update: The 2-pack is sold out, but individual Minis are still on sale for $34. If you’re all in on the Google ecosystem, you can put two more Google Home Mini smart speakers in your house for $48 today, courtesy of Walmart. That’s the best deal we’ve seen on these since Black Friday, and not bad considering they usually sell for $49 each. Have any more rooms in your house where Alexa isn’t available? That’s an easy fix right now, as Echo Dots are marked down to $35 from the usual $50. Unlike deals running now on Kindles and Fire tablets, this isn’t a refurb either, it’s brand new. It’s 2018, and your vacuum shouldn’t have a cord anymore. Dyson’s cordless V-series stick vacs have long been go-to cordless options, but the powerful new V10 is arguably the first that can truly, completely replace a corded vacuum, at least for smaller homes. We haven’t really seen any discounts on the V10 since its release in March, but Amazon’s now taking $50 off the entry-level Motorhead configuration, which has a smaller bin and fewer accessories than the $600 and $700 versions, but which uses the same powerful motor. If you care about your knives even a little bit, you know that you should never put them in the dishwasher. This Joseph Joseph BladeBrush will make cleaning those knives (and any other utensil) that much easier. Today’s price of just $7 is the lowest we’ve ever seen February and a good $3 less than the typical list price. Have you tried to buy jerky lately? It’s expensive as hell! Luckily, you can make your own at home with this $155 highly-rated Excalibur food dehydrator. It boasts 15 square feet of dehydrating surface area, and of course, can be used to make your own dried herbs, fruits, and vegetables. My wife owns the dehydrator that’s on sale. I don’t think I’ve used store-bought chili powder, basil, dill, oregano, thyme, or a dozen other herbs and spices in the last two years. The Excalibur is legit in a dehydrator class of its own. $175 is the usual deal price on this machine, so today’s $155 is exceptionally great. This deal will only last through the end of the day or until product sells out, so don’t wait for the sale to dry up. You can take that funky taste out of your tap water with these discounted Brita pitchers. At $14, the 5-cup Metro pitcher is available in three colors and comes with one filter to get you started. If you already have a pitcher and want to stock up, snag this 8 pack of replacement filters. It’s discounted by $13 today. You can never have too many baking sheets. This 3 piece set from AmazonBasics includes a small, medium, and large nonstick sheet for just $4 each. That’s about a $4 discount from the usual. If you’re looking for more full-sized sheets, this 2 piece Nordic Ware set is 15% off right now. Treat your cat to this Furhaven tree from Woot today. It’s about 4 feet tall, has scratching posts for legs, and a springy wand toy they can paw at for hours. The cream, brown, and blue colors are $34, down from their usual $55. It might be counterintuitive, but the sharper the knife is, the safer it is to use (because a sharper knife requires less force). This Chef’s Choice sharpener uses 100% diamond wheels in three stages to manually sharpen both serrated and non-serrated knives. Today’s price of $35 isn’t the price we’ve ever seen, but it is a decent discount from the usual $43. Once, when I was young and naive, I paid a dealership like $75 to clean my foggy headlights. Little did I know, this Turtle Wax headlight restoration kit does just as well at a tiny fraction of the price. Get it for just $6 today, with free in-store pickup. You don’t need to buy a new car to get a life-changing backup camera, you just need $127 (with code HR3GQZZX), and a few minutes to run the wires. This model attaches to your license plate, and runs to a special rear view mirror that attaches in front of your existing mirror. Oh, about that mirror...it has a dash cam built into it. Just pop in a microSD card, and you have a backup camera, plus a forward-facing dash cam to record any accidents. It even works as a lane departure warning system, if your car doesn’t have one. Epicurean makes some of our readers’ favorite cutting boards, and they’re on sale on Amazon for the first time all year today. They’re just $10, dishwasher safe, and small at 8" x 6" small, so grab a few so you don’t have to keep one clean all the time. The 11.5" x 9" version is also about $1 less than usual today. I know, I know, kitchen uni-taskers are bad. But, if you plan on shucking more than one cob (like when making delicious Mexican street corn), you might consider a more efficient tool. This corn stripper works kind of like pencil sharpener, removing corn kernels with way less work. Amazon’s pulling out all the stops to promote Prime Pantry in the lead up to Prime Day, so you should cancel your next trip to the grocery store and stack the digital discounts while you can. There are a few things going on here, so check out our post to learn more. As part of their Prime Day early access deals, Amazon’s taking up to 20% off a bunch of AmazonBasics stuff right now for Prime members. The selection here is...eclectic, with options ranging from medicine balls, to kitchen shelves, to flatware, to luggage, to a shredder, to a headboard, and a whole lot more. 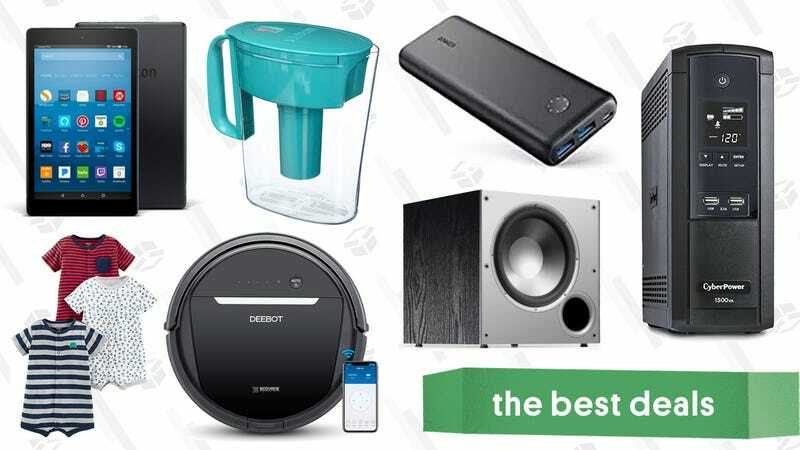 With few exceptions, AmazonBasics stuff is well made an an excellent value, and that’s even more true than usual with this sale. Just note that you’ll only see the deal prices if you’re logged into an Amazon Prime account. Rack up 20% off a whole bunch of laundry essentials from this early Prime Day sale. The sale has everyone’s favorite Tide Pods in a few flavors scents, plus dryer sheets, fabric softeners, scent boosters, and more. Some items require you to hit the check box on the product page to redeem the coupon, while others will automatically take the 20% off. Just remember, you won’t see the discount until checkout. And as always, you can save a little more if you Subscribe & Save, and have the freedom to cancel your subscription at anytime after your first order ships. If you live in a city with Amazon’s same-day Prime Now delivery service, but haven’t gotten around to using it yet, they’re running a fantastic promotion for new members to celebrate the lead-up to Prime Day. For a limited time, you can save $10 on your first Prime Now order with promo code 20PRIMEDAY, and then automatically receive an additional $10 credit to use before the end of the month on another order. This deal requires you to spend at least $10.01 per order, so you can basically pay a penny (not including tip and taxes) to get snacks, ice cream, household essentials, and more delivered to front door. This year’s options are greater than ever, with the discount available on anything ordered from Amazon or Whole Foods Market (excluding alcohol, digital content, and any ordered placed using Alexa). If the name doesn’t make it clear, you’ll need to be a Prime member to take advantage of Prime Now, but you can sign up for a 30 day free trial here. Amazon’s really ramping up the deals this week in preparation for Prime Day. You can save on a whole bunch of Amazon’s own brands of food, beauty, coffee, vitamins, and more. If you’re looking for some suggestions, I’d check out these laundry detergent packs, and this wide selection of coffee. Most of these products are at all-time lows, so get to shopping. It’s never a bad time to replace some of your kids’ old clothes, and Amazon is ready to help you time and money. Right now, Prime Members have their pick of clothing from brands like Starter, Simple Joys by Carter, A for Awesome, Kid Nation, and more. The options span from newborn all the way up to preteen (if they still let you pick out their clothes by then). If you’re fully bought into the Fitbit ecosystem, the company’s second generation smart scale just got its best discount ever on Amazon. The Fitbit Aria 2 syncs with the Fitbit app on your phone to give you a better sense of how your activity level affects your weight. And unlike most smart scales that use Bluetooth, and require you to open a specific app on your phone, Fitbit’s solution works directly with your home Wi-Fi network for seamless data syncing. At $100, it’s certainly more expensive than other smart scales out there, but if you’ve been a loyal Fitbit user for awhile now, and want to keep everything within the same ecosystem, this $30 discount is the best we’ve seen so far. For the cost of a couple month’s gym membership, you can skip the gym the all together and workout at home with this Gold’s Gym XRS machine. Build muscle on both your upper and lower body with a 112 pound weight stack and up to 280 pounds of resistance. The machine comes with a high and low pulley system, a lat bar, 4-roll leg developer, and it will ship for free. Today’s price is a good $50 less than its Amazon’s price, and you save a couple of bucks if you select in-store pick up. Whether you’re using them at home or on the road, this resistance band set lets you get a full workout basically anywhere, and at $14 (with promo code W6P3SNZJ), it’s quite a bit more cost-effective than joining a gym. Stand-up paddle boards are never cheap, but this Kawasaki Watercraft Edition board on Woot is discounted by $250 compared to this its Amazon price. It’s inflatable, which means its a little softer on your feet and way easier to store and transport. The air pump and oar are included in the $400 price tag. So if you’re in the market, this would be a fun summer activity. KTENS (Transcutaneous electrical nerve stimulation) massagers seem a bit like pseudoscience, but every time we post a deal on one of these things, we hear nothing but rave reviews. In fact, I use one occasionally after exercising, and it does seem to reduce muscle pain. At the very least, it feels cool. Love to read but don’t have the time to sit down and actually read a book? Sign up for Amazon’s audiobook service, Audible for 66% less than usual during their Prime Day promotion. For a limited time, Prime members can get three months of the service for $5 each, down from the usual $15. That entitles you to a new book of your choice each month, and everything you buy is yours to keep, even if you cancel after the three month promotional period ends. The offer is available to new subscribers only. Kindle Unlimited is basically Netflix for ebooks and audiobooks, and Amazon’s offering a very rare discount on the service today. You’ll get your first three months for just $1, after which you’ll be automatically billed the regular $10 per month, unless you cancel. If you love to read, this is a great chance to sample the service without fully committing. The deal is exclusive to new Kindle Unlimited subscribers. At $8 per month for Prime members, Amazon Music Unlimited was already more affordable than Spotify Premium or Apple Music, but Amazon’s sweetening the pot for new members by offering four months for just $1, for a limited time. This is by far the best deal they’ve ever offered on the service, so if you’re a Prime member but haven’t signed up for Music Unlimited before, what’s $.25 per month to try it out? Octopath Traveler is finally out on Nintendo Switch this Friday, and JRPG fans can preorder it now to save $12 with Amazon Prime. Just note that you won’t see the discount until checkout. Update: It will depend on availability in your area, but you can get a Switch for just $225 from Google Shopping Express via Target with promo code EXTRA25. The Nintendo Switch basically never goes on sale, but if you still haven’t picked one up, it’s down to $280 on eBay today, with no sales tax for most buyers. It’s only a $20 discount, but hey, that’s enough money to buy Stardew Valley. Wear your love of Twitch on your sleeve...or your leggings, onesies, tank tops, or romperjacks. In preparation of Prime Day, Prime members can clip a 50% coupon on a bunch of Twitch-themed merchandise for a limited time. Just pick your product, select your size, then clip the 50% coupon to get the discount at checkout.